The head of Indian cricket should relinquish his International Cricket Council role while corruption allegations are investigated, the international players' union has said. N Srinivasan has already temporarily stood down as president of the Board of Control for Cricket in India (BCCI) following a Supreme Court ruling. But Federation of International Cricketers' Associations chairman Paul Marsh said: "He should not be exercising any functions on behalf of the ICC either." The 69-year-old, regarded as the world's most powerful cricket administrator, is due to represent the BCCI at an ICC executive board meeting in Dubai next week. His possible elevation to chairman of the ICC - as part of changes to its governance - is expected to be discussed. Srinivasan stood down from his BCCI role following a ruling by India's Supreme Court last month. He is also vice-president and managing director of India Cements, owner of the Chennai Super Kings team in the lucrative Indian Premier League - and one of two teams implicated in a spot-fixing investigation. 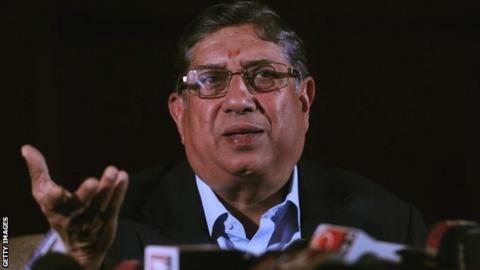 The Supreme Court ordered that no member of India Cements should be involved in BCCI matters during the investigation. Former India captain and batting legend Sunil Gavaskar has since been installed as the interim head of the country's cricket board. Marsh said his organisation was unhappy at Srinivasan holding an ICC role while he and his company remained under investigation. "For our game to survive we need it to be not only free of corruption but free of any suspicion of corruption. "Under the current circumstances, the prospect of Mr Srinivasan taking the highest posting in world cricket while these matters are unresolved, is an impossible one." The Indian Supreme Court's next hearing on the case is due on 16 April.